Today I stepped out of my fashion comfort zone. 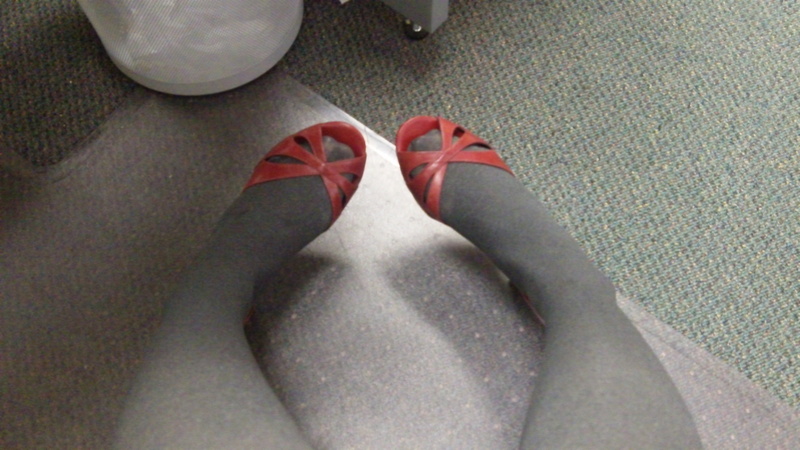 The decision: Unsafe, red, open-toe shoes with gray tights or safe, standby, black heels? I had on one of each and said to myself, “No, you need to push yourself, wear the red shoes.” So, I did. I am proud of myself. Next time, the red shoes won’t be so scary. Sitting at my desk with my red shoes. Have you stepped out of your comfort zone lately and worn something new? I’d love to hear about it (and see pics if you’ve got ’em)!